April 18, 2018 at 13-00 in the Central city library (22, Irtysh Embankment named after Slavsky) in the framework of program «Рухани жаңғыру» will be held the patriotic hour, devoted to the 100 anniversary of Kasym Kaysenov – Халык Каhарманы, the famous Kazakhstan's writer, laureate of the A. Fadeev international Prize. The aim of event: education of historical memory among pupils on the base of respect for the history of the state and the defenders of Motherland - our countrymen. Kasym Kaysenov was born on April 23, 1918 in Asubulak Ulan district of East Kazakhstan region. During the Great Patriotic war the folk hero and future war writer fought in the partisans detachment against the fascist invaders and liberated Ukraine, Byelorussia and Carpathians. It is difficult to overestimate the trace left by our famous countryman in the history and in the hearts of Kazakhstans.Even during the war his name became legendary. The event will be accompanied by a multimedia presentation. In the framework of patriotic hour the fragment from film «Kasym» (2015) will be demonstrated. 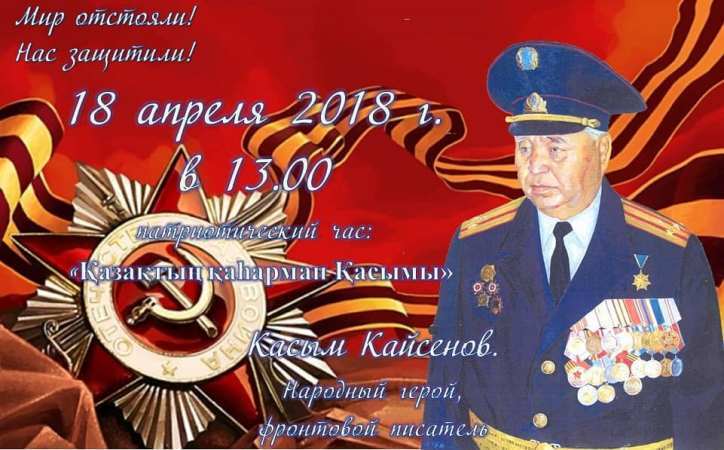 At the end for pupils will be held a quiz about the life and deeds of Kasym Kaysenov.